Although many homes have a clothes dryer, few people realize the importance of dryer safety. In fact, according to the United States Consumer Product Safety Commission, there are about 15,500 fires, 10 deaths and 10 injuries that occur each year due to dryer fires. In addition, there are hundreds of individuals that are exposed to carbon monoxide poisoning as a result of not following proper dryer safety measures. Although dryer fires may be a result of faulty appliances, there are several ways you may be able to prevent dryer fires by taking a few safety precautions. 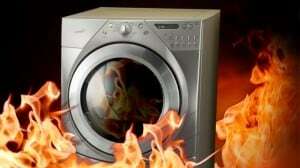 One of the primary causes of dryer fires is due to lint accumulation. As more lint begins to collect, this can reduce the airflow feed, making conditions ideal for a dryer fire. Many individuals are not aware of how incredibly combustible lint actually is, therefore, it is highly important to clean the lint catch in your dryer after each cycle in order to reduce the chance of a fire. In the past, a majority of clothes dryers were placed in the basements of homes; however, many new homes usually have their dryers located in bedrooms, bathrooms, kitchens and hall closets (away from an outside wall). Because of these new locations, the vents of the dryers are typically installed with sharp turns and bends in order to accommodate the structure of a home. This often makes the vent more difficult to reach as well as create more places in which lint can accumulate. In addition to creating more potential fire hazards, clothes usually take a longer period of time to dry due to the vent’s length and number of bends. When it comes to choosing a location for your dryer, you will need to be sure that there is enough clearance space between the dryer and the wall. By placing the dryer directly against the wall, this could result in crushing the venting material. Reduced airflow and lint buildup will prevent the dryer from drying clothes at the normal rate. In addition to cleaning out your lint filter of your dryer, you will also want to consider the exterior of the dryer as well when it comes to preventing fires. There are many types of dryers available today; however, there are several improper dryer vent practices that can restrict airflow and ultimately lead to lint accumulation. One of the most common dryer vent mistakes is if the dryer vent is too long or includes too many bends. Dryers that do not use a dryer duct booster will often result in lint collection, therefore, the shorter and straighter your dryer vent is, the better. In addition to having a short and straight dryer vent, you should also avoid investing in a dryer that uses flammable, plastic or foil duct extenders. Only metal vents should be used for your dryer and a majority of dryer manufacturers will specify this. Metal vents are ideal for resisting crushing. As a result, your dryer will have better airflow and more lint will be carried out of the system. Contact C&W Appliance Service If you have any questions about dryer repair or need to schedule an appointment with one of our dryer repair technicians to repair your dryer.